Brew Facts: Although Lot 6 is considered to be a bolder version of Lot 3, Evolution’s standard IPA, there are major differences in the hop and malt profiles. As a fan of Lot 3, I was interested to get my taste buds on Lot 6, but it’s clear they are separate beers. Appearance: Large, fluffy lump of foam on top like an ice cream float. A clear amber, redish/caramel color without a hint of proteins or haze. Has the typical copper hue that most DIPAs seem to have. Aroma: Hoppy and heavy resin/citrus aroma. Nice malt and toasted grain with a subtle sweetness on it. Astringent lemon mixes with tangy alcohol. This is a really nice aroma that benefits from the toasted quality to add a nice note to the resin and citrus. 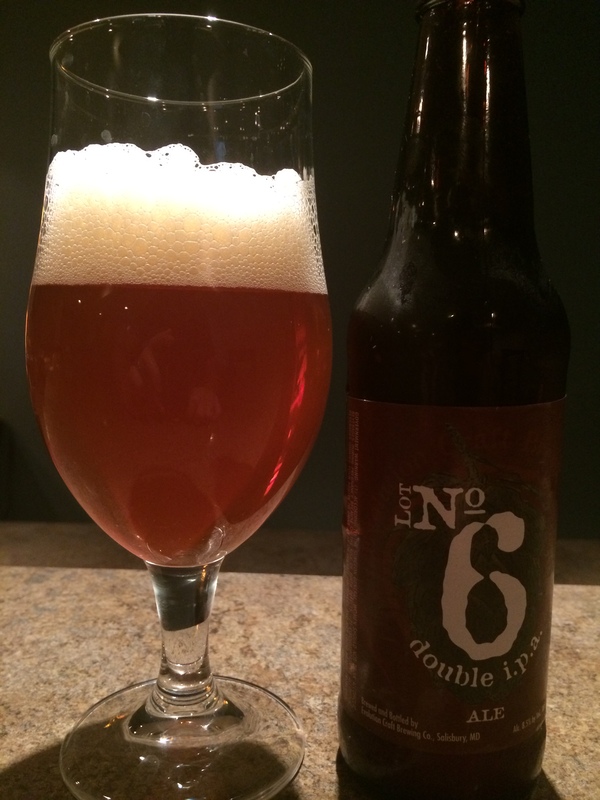 Taste/Mouth Feel: Mouth feel is a little syrupy with an almost flat level of carbonation. I think this would benefit from being a little bubblier. Not bad, but skirts the line between a lighter, refreshing mf and a fuller richness. Some resin and sweet/honey on the mild citrus side, but the whole experience is a little dull. The hops are muted, the biscuity malt is there with a slight toast, but it’s really disappointing at how lifeless it is. Very warm finish, that doesn’t get offensively boozy. An earthy bitter finish lingers on the tongue. This is the anti-crisp, coming across pretty soft. What flavors are there do balance well. I know that not all DIPAs are going to have a huge hop presence, this tastes like the bottle sat around too long. I checked the bottled date (Feb 2014) and I drank this in July. Clearly, I’m not having the hoptimum experience, but I can only evaluate what is in the glass. Final Thoughts: If I was asked which of the two I prefer, Lot 3 works better for me on a whole. The lighter body and brighter citrus make it a solid IPA that I still enjoy. Given the major differences between Lot 3 and 6, it’s probably foolish to compare them, but Lot 3 informed my desire to try 6. I was hoping for an experience that built on Lot 3 to make it even better, but that isn’t the case. Separating Lot 3 from the mix, this beer is fine, but that’s all. I would place this firmly in the average category, but I will make it a point to have a fresh version to see if it improves. If my experience holds, that nice, toasty resin aroma is delectable and the taste is balanced, but it isn’t enough to overcome this pedestrian DIPAs shortcomings. The lack of assertive qualities or identity makes this a boring beer. Nothing for the fresh hop heads or bright citrus pine nuts out there to get excited about, but you can do far worse.